The long stretch of road between LA and Vegas is basically a rite of passage for many a 21-year-old Californian. It takes about 4 and half hours (if you go the speed limit) and many believe it is just desolate desert with nothing to do. While a lot of the travelers just want the drive to be fast, there is actually a lot to do on the way. Use this post to make your next drive more of an adventure and less of a race. These stops are in order of the drive starting from Los Angeles. 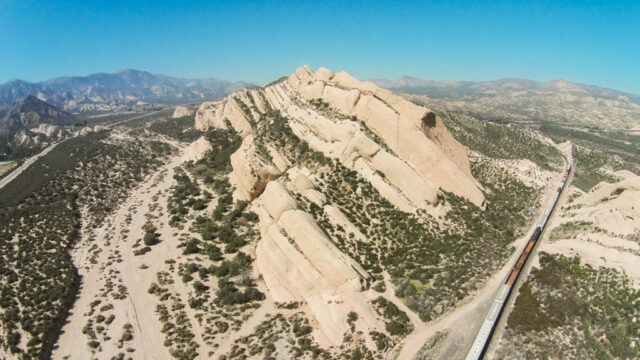 Since most people like to get out of the city before they make their first stop, this post purposely starts at the top of the Cajon Pass. Here begins your adventure. Right off the freeway as you approach the top of the pass, these rocks will immediately catch your eye because of their size. You don’t have to travel very far off the road to see them because they dot the landscape for miles. 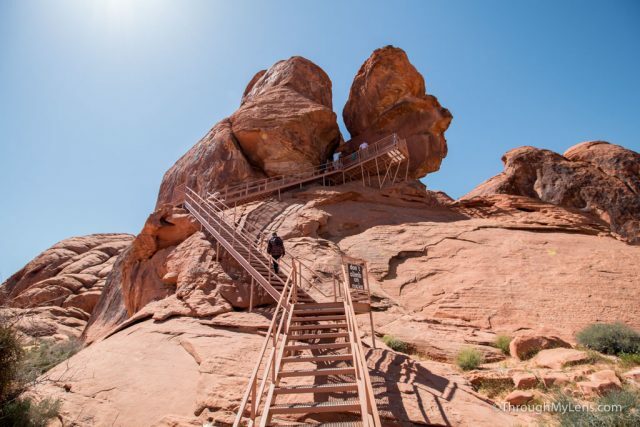 The main visitor center and the walk are about 5 minutes off the freeway, and the one-mile loop gives you a lot of great views of the massive sandstone giants. 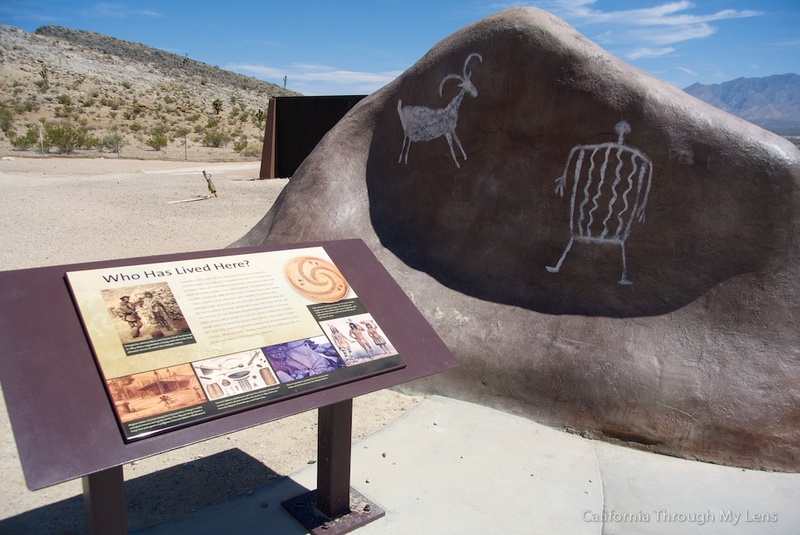 The trail begins at the Mormon Rocks fire station located on Highway 138 just west of Interstate 15. 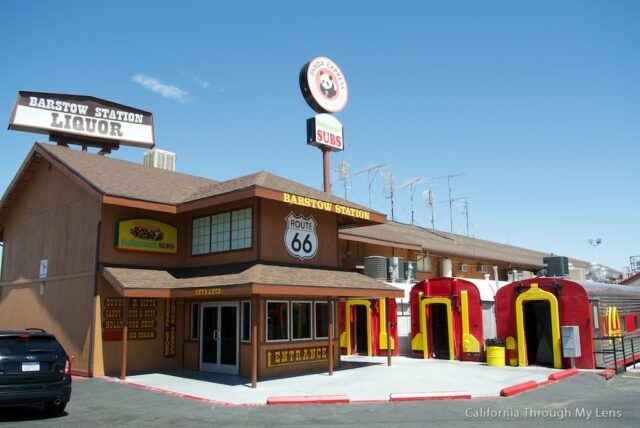 If you have a time, I suggest you get off on exit 153a near D Street and take old Route 66 up from Victorville to Barstow. 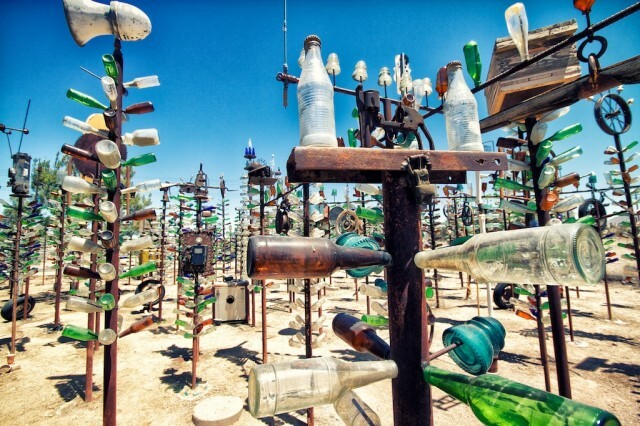 On this drive, you will see old diners, my favorite antique shop, an ostrich farm and the diamond of the road: the Bottletree Ranch. This ode to independent art is a beautiful and odd stop that you will not forget. Elmer’s collection of metal trees full of old bottles and other vintage things is fun for a stroll or a photographic adventure. One of my favorite spots on the whole drive. 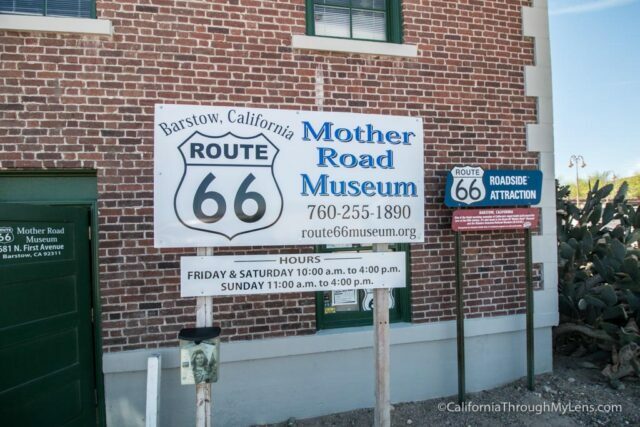 Located in the old train station in Barstow, the Route 66 Museum is a great stop when it is open (Usually Friday – Sunday, 10AM – 4PM). 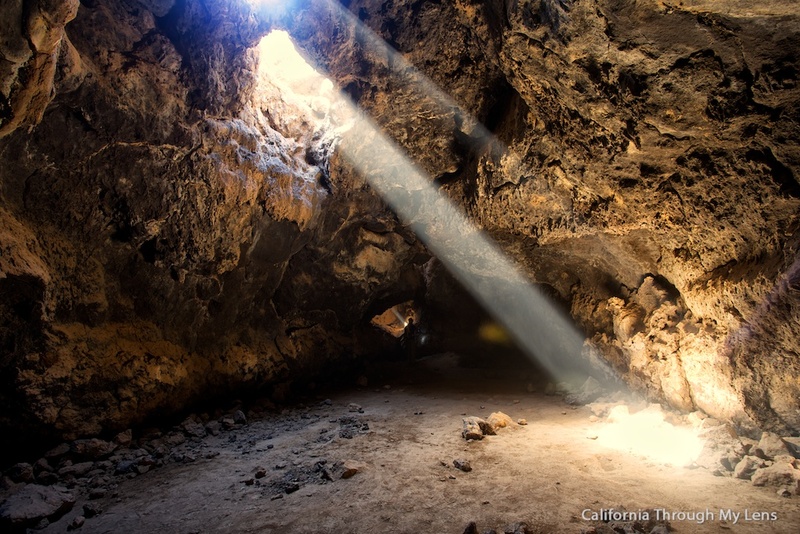 Within half a mile of each other, you have both the oldest meteorite in the USA and the original Del Taco. It will depend on your personality as to which you are more excited about, but you can always do both! 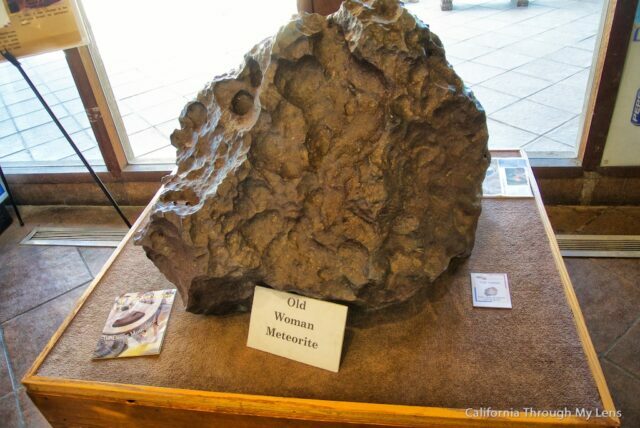 I usually pick the meteorite and venture into the children’s museum to see it. This stop will not take very long but it’s cool to see at least. If the last two were not your thing, you could stop at the train car on the last exit in Barstow. This spot is on Route 66 as well, and it provides a fun stop for the whole family with lots to see and eat. Keep in mind that it is popular so it’s always packed. Basically, it is an old railroad station that is now a series of stores and food options. 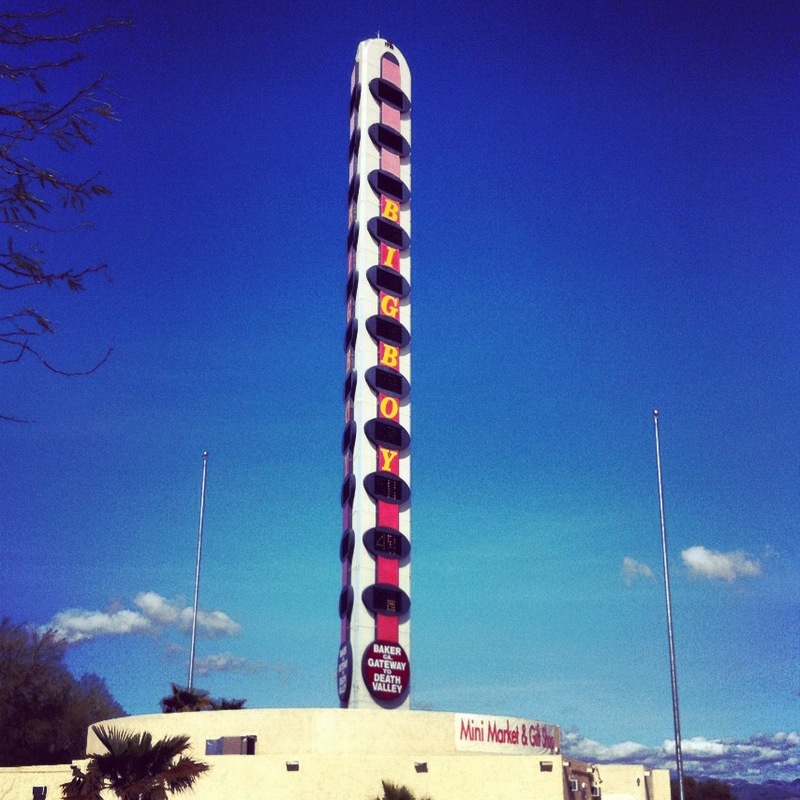 They call themselves the “Disneyland of gas stations” and it is easy to see why. This massive store has everything from ice cream and drinks to pizza and snacks. It is probably 6 times the size of a normal gas station. 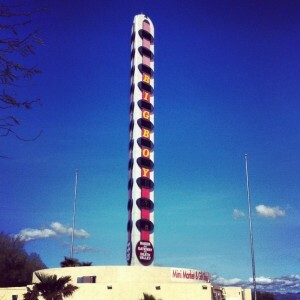 They also have a four-story ice cream sundae outside and a shrine to the Lakers basketball team inside. Be sure to make a quick stop there. 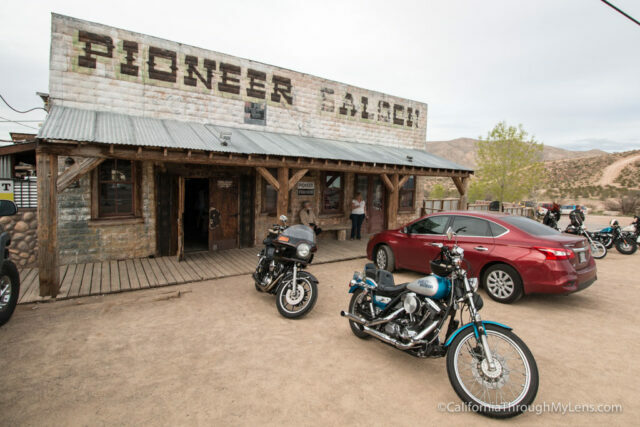 This commercial ghost town is not my favorite stop but is worth visiting at least once. There are a lot of great photo opportunities here, and there is exploring for the whole family in this historic town. The highlight is a long mining tunnel you can walk through for a fee. If you are looking for a place to eat, this is a great stop. 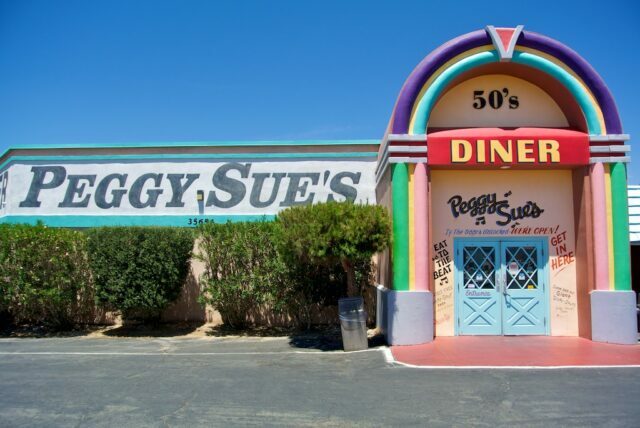 They have all the food you would expect from a diner such as hamburgers and apple pie. When you finish eating, there is a large garden outside complete with metal dinosaurs and a shop where you can buy 1950-60s memorabilia. As made famous by a Sheryl Crow album cover, many people love to stop at this sign for a photo. The old restaurant is no longer there, but for many, it is a great picture to take. While this is pretty far for a short trip, I have to say something about the preserve because it is the third largest national park in the United States and is literally full of adventures. Here are the closest ones to the highway (although neither are very close). 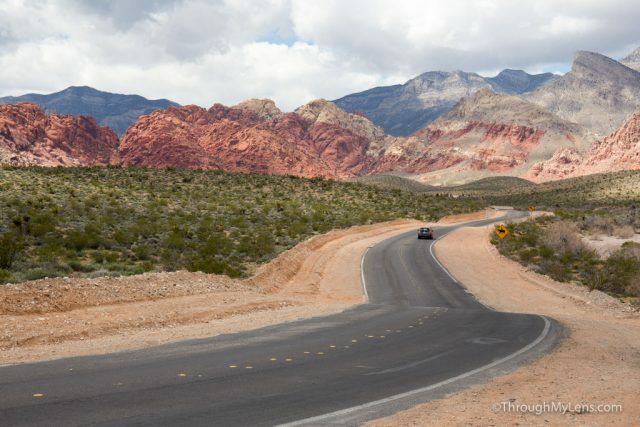 Everyone who has driven to Vegas has seen this road, but few actually get off on it. I got off to visit, and it is a pretty trippy place. You drive about 5 miles down half paved half dirt road, and there is an enormous dry salt lake bed and an old compound that has its own awesome history. This is a great stop once, but it is strange to be down there with literally no one else so it may not be your thing. 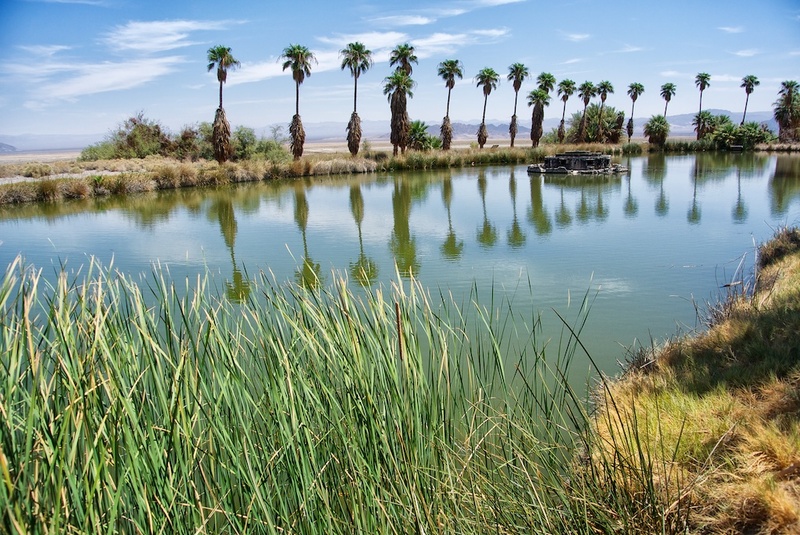 Read about Zzyzx Road here. The town of Baker is a must stop, especially since there has been nothing for the last 60 miles anyway. There are a lot of great stops here that you can see in a short span. 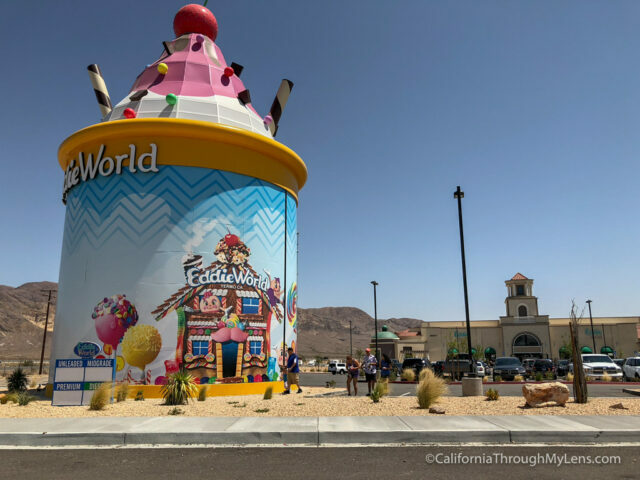 I recommend the statue to the discoverer of the North Pole, a strawberry shake from Mad Greek, Beef Jerky from Alien Jerky and then a picture of the world’s largest thermometer. Check out all the stops here. If you have an extra day you can head into Death Valley from here as well. I wouldn’t recommend rushing it though so if you don’t have at least 24 hours then go to the park at a different time. Here is a video I made on how to spend 24 hours in the park. I know it is strange to call out a rest stop, but there isn’t much left in California on this drive. 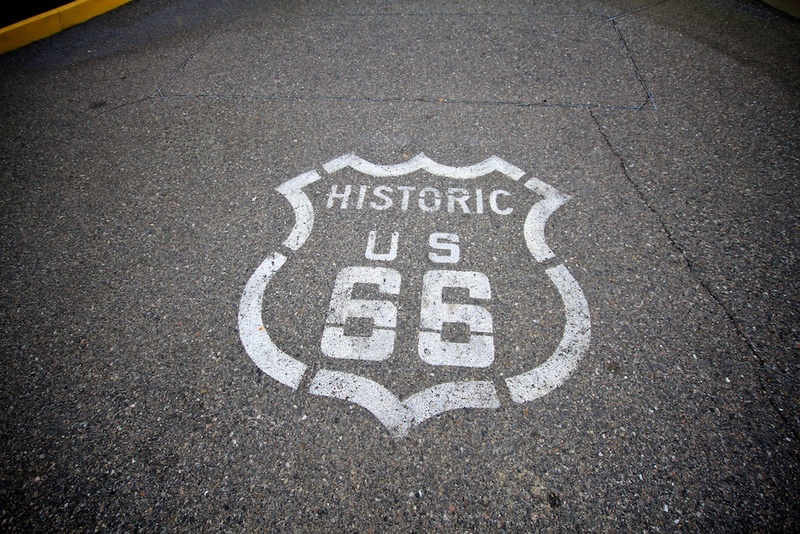 This rest stop is cool because it has a ton of history for the surrounding area and a “Welcome to California” sign. It is one of the nicest rest stops I have ever been to. 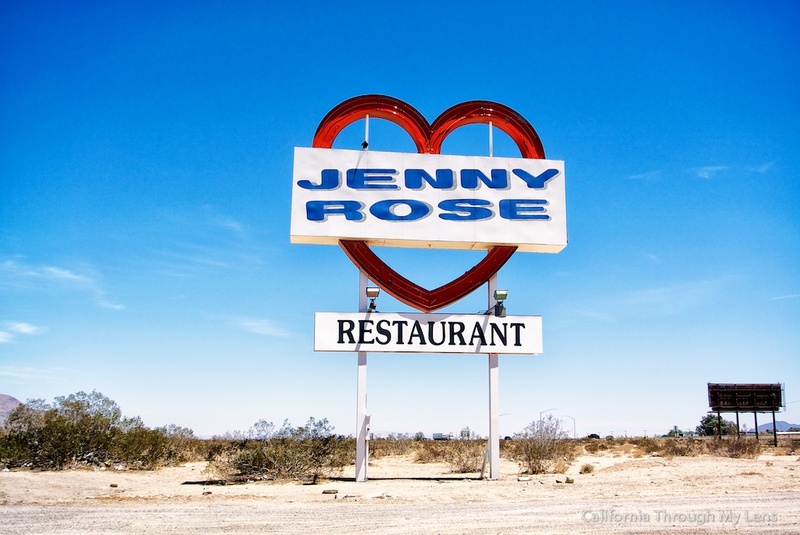 Literally, the last place you can stop on this drive (in California) is the lottery shop. This shop on the outskirt of Primm is a stone’s throw from the border and was put in specifically on the California side for the Nevada residents to buy California lottery tickets when the pot is big. I have heard the lines can get pretty long, but I am not much of a lottery player, so I am not positive. 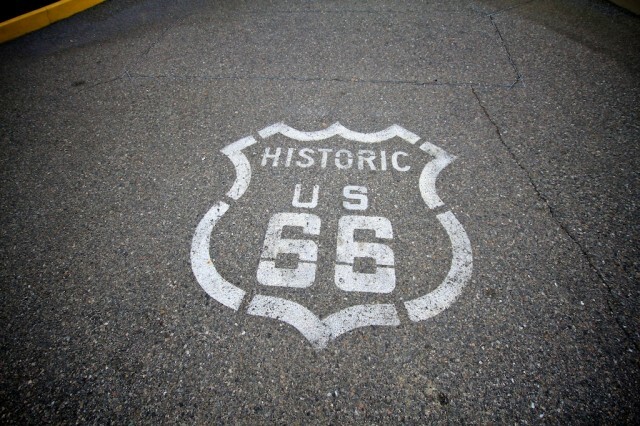 These last few are all technically in Nevada but still awesome stops. 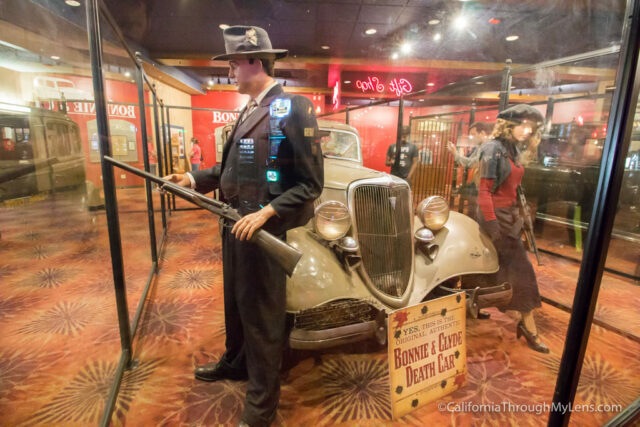 Inside the Whiskey Pete casino at Stateline is this exhibit dedicated to Bonny and Clyde, complete with the car they were shot in which still has a bunch of bullet holes. 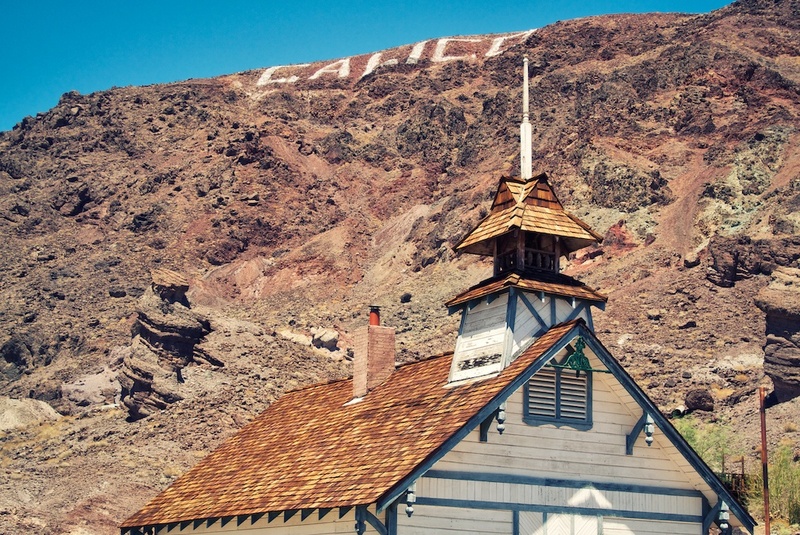 One of the oldest bars in Nevada (about 15 minutes off the freeway). 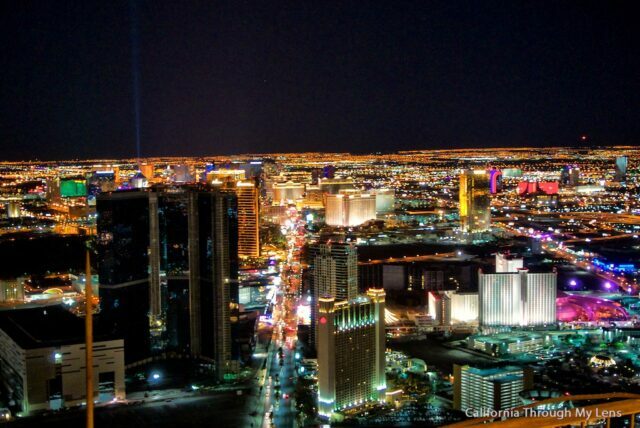 It was frequented by Clark Gable and many other celebrities. Good spot for food and drinks. 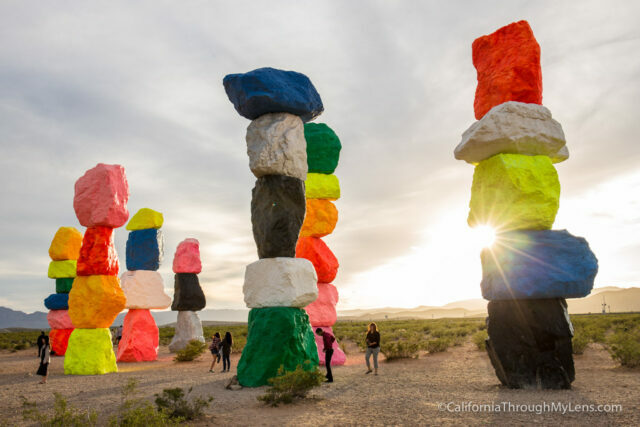 This art installation is one you have no doubt seen before on social media. It should be here until sometime in 2018 so be sure to check it out. Here is a video I made of all these stops and more on the way from LA to Las Vegas. So there you have it, my list of stops on the drive to Vegas. Hopefully, this helps you have more of an adventure on your next drive, and at least if you lose all your money when you are there you can see something fun on the way home. Feel free to comment anything I left off below.